After 7 months at home with my daughter, I am so excited to open my private practice back up! Since last fall, I’ve been on extended maternity leave to spend my days in the up and down world of being a new parent. For those of you who’ve been there, you know how life-changing (and hard) this is. From the sleep deprivation to breastfeeding woes to the constant need to be ON, it’s just hard. At this point, I am happy to say I have crossed the threshold that experienced parents told me about: that it gets easier. And since things have gotten easier, I have been able to spend my time nourishing myself, and brainstorming and dreaming up how I want my practice to grow and evolve. 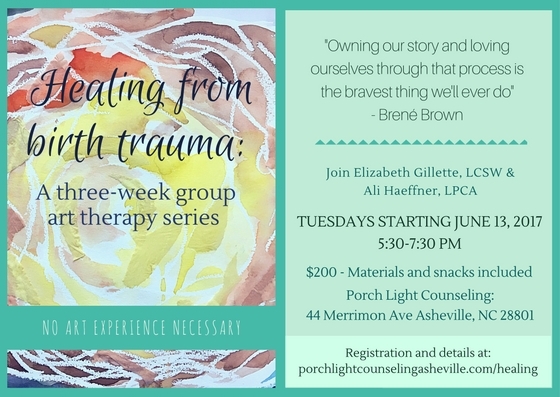 One of those ways is a group art therapy series on Healing from birth trauma (you can read more about it below). Working with parents in the perinatal and postpartum sphere is something I feel committed and called to do, especially after going through my own experience. I’ll be taking a certificate course in July to increase my awareness of the issues that come up during pregnancy and beyond. Asheville is a wonderful place to raise a family and I am excited to be among the many offerings to support families. Happy art-making and hope to see you soon!